My track on the Gold Coast is a routed 4 lane board track with a 30 meter lap length. Has magna braid and 125mm lane spacing. Mainly used for 1/24th scale model car racing, but I also support 1/32nd racing for those guys that like to run them. Across the board I promote all brands and 'commercially open' classes are generally raced. Typical 1/24th scale model car laptimes in the 5.2 to 6.3 second range. Flexi's are getting down under 5 seconds. 1/32nd Plastic muscle cars at 6.5 seconds and standard NSR Mosler quickest plastic so far at 5.5 seconds. Plastic times are with one magnet only. Give me a PM if you would like to come give it a try. Bring what you have and join us on any Wednesday night. Edited by Springbok Racer, 11 October 2014 - 06:10 AM. Jan looks fantastic mate! If I'm down your way I'd love to go for a run on it! SCX Digital.............The way to go!! Track looks great though. Looks like the kind of track that my NSR Mosler would really be able to stretch its legs. You guys are very welcome if you're ever in the area.............. BTW, The NSR Moslers go GREAT on EE.au!!!! Ps. Foggy, the guys from Narangba usually come down on the 2nd and 4th Tuesday nights. That is one awsome looking track.Pm coming your way,would love to come to a race night. 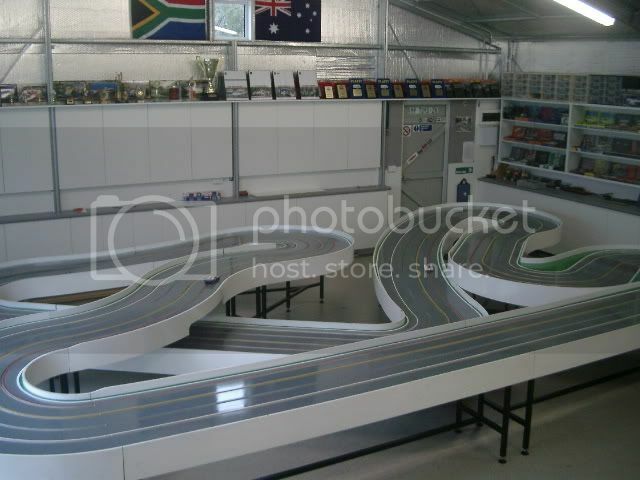 This is where we are hosting the 2013 1/24th Scale Auto and OAPR LMP Qld Championships enduro during April. Drop in when you in the area and have sticky. If you what to know more about the event have a look here on the forum under 'Special Events' and if you want to know more about the track, just ask. Or send me a PM. Very nice track there Jan.
Now, a question, and the background. When I got into slots 6 years ago, I visited a lot of Oz tracks in NSW and Vic. and almost everyone ran ferrodore, and on the forum almost everything was ferrodore, - and they were mainly running urethane tyres that worked fine on ferrodore, - but medium grip only, and fast wear rate. But we went the "clean track" and gloss surface route, using mainly silicons, but some rubber for odd tyre/wheel size classes. Now I see Alex is converting one track at Xtreme to gloss, you are gloss, and you're both running a lot of SA 1/24. So I am wondering what sort of tyres you guys are using, and whether this is something in Oz mainly relating to the 1/24th racing; - or whether there is more of a shift towards gloss track over there in the lucky country, now that good soft rubber tyres - and foam tyres - are available for RTR products. I'm not the one to ask as I only arrived in Aussie some 10 years ago myself. However, all the tracks I have ever raced on over the past 40 odd years; South Africa, America, Canada, Japan, Europe and here in Australia - have always been gloss. I have raced both 1/32 and 1/24 and we have always used a foam or rubber tyre. Currently we almost exclusively use the natural rubber foam tyres that are available from Scale Auto in a RTR format. The ProComp3 compound on the rear and the hard compound on the front. Edited by Springbok Racer, 10 March 2013 - 08:15 AM. As Jan has said most tracks now are following what the commercial track have always done, gloss. Gary J would be the best person to ask. Most ferrodore tracks are in home sheds in and around Vic. I have built a few tracks over the years and have always been in gloss, always used mjk on plastic cars and foam on the bigger scale cars over the past few years, my preference is Plafit over the Scale Auto especially now they are ready to run. They last longer and have better grip especially on tracks like Jans, ps are you racing this we'd? Paul NZ - Scale with Detail! ..............my preference is Plafit over the Scale Auto especially now they are ready to run. They last longer and have better grip especially on tracks like Jans, ps are you racing this we'd? Our next race meeting is on the 20th.....and you are very welcome to bring any Plafit tyre you like and show us it is better than the Scale Auto's ......there is absolutely NO difference my friend, they are both Black Magic rubber. Don and I dropped into Jan's last night for a look at the facility. Sorry guy's, can't remember all of the names but we were warmly welcomed and introduced around, got to have some track time, got to help with marshalling duties and generally had a great time. We will be back soon, next time with some of our own cars to run around on this super track. Once again, thanks to Jan for his hospitality. Great to have you come along Steve and Don.. you picked up the track very quickly so now that you've driven the Ecurie Elite track you will understand why we we keep going back for more. Sure... there's good food, ( when Jans wife is in town) all season air conditioning and Jans man cave toys to drool at... but the main drawcard is the track itself and the guys that race there. To win at Ecurie is a challenge that just does not diminish... its one of those rare track designs with at least 3 sucker punch corner configurations that really make you work to have a perfectly executed lap... (lap after lap if you're going to win) and a level of racing that makes it truly satisfying when you manage a podium placing. Was good to meet you and Don. You guys are very welcome to enjoy the racing with us any Wednesday night. Bring your cars, we will find you a class to run them in. Please bring your mates from Poppa's and Browns Plains too. Just warn them - we are an open minded bunch when it comes to scale model car racing. This track is now for sale. Send me a PM if you are interested. I am planning to replace it with a new track in 2017.